In 1993, when the Cardinals made their first regular-season visit to Miami, several fans of the expansion Marlins switched their allegiance to St. Louis for one game. Cardinals pitcher Rene Arocha, a Cuban defector who settled in Miami, had the support of the South Florida Cuban community when he started against the Marlins on June 23, 1993. 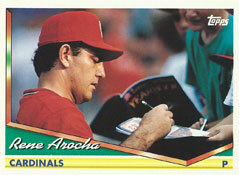 Arocha was a Cardinals rookie right-hander in 1993. Two years earlier, on July 10, 1991, while with the Cuban national baseball team, Arocha defected to the United States. He walked out of Miami International Airport and into a waiting car, becoming the first member of Cuban president Fidel Castro’s baseball team to defect, the Sun-Sentinel of Fort Lauderdale reported. Miami became Arocha’s adopted hometown. The Cardinals won a lottery among major-league teams for the right to sign the Havana native. As anticipation built toward game time at Joe Robbie Stadium, so did Arocha’s anxiety and adrenalin. Cardinals manager Joe Torre and pitching coach Joe Coleman tried to calm him. The Marlins led, 1-0, after an inning. Arocha changed the momentum in the second in a most unexpected way. After the Cardinals scored a run to tie, they had the bases loaded with one out and Arocha at the plate. Arocha, hitless in his first 19 major-league at-bats, drilled a two-run single to center off starter Ryan Bowen, giving St. Louis a 3-1 lead. Arocha pitched 5.1 innings, yielding six hits and three runs, walking two and striking out two. As he departed, he received a standing ovation from the crowd of 37,936. The Cardinals received 3.2 innings of scoreless relief from Paul Kilgus, Rob Murphy, Mike Perez and Lee Smith, winning, 4-3, and boosting Arocha’s record to 6-2. Boxscore He would finish the season 11-8.